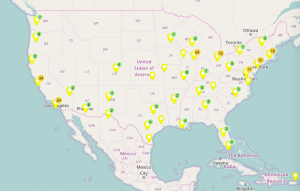 As regular readers know, I recently rolled out a project to build a database of economic justice organizations in the US. It’s one of the things I’ve been curious about for a while–how good a job are we doing at building permanent, long-lasting infrastructure, in the face of increased attacks on traditional unions. As it turns out, we’ve got some real work to do to make sure that workers all over the US are able to build power for themselves and their families. At this point, the database includes information on a total of 293 organizations, most of which are statewide or local groups–18 are national organizations or networks. When I set out to collect information on these groups, I built a list of organizations that are affiliated with national networks–organizations like the Center for Popular Democracy, the National Domestic Workers Alliance, Jobs with Justice, PICO, etc. There are a couple of reasons for that, but the most important one is that, in my experience, it’s much more likely for local base-building groups to be able to raise funding from national foundations if they are connected to a national network that helps to validate and broadcast their work outside their own city or region. I also think that local groups in a national network benefit from the resources of the national network–things like research departments that can provide corporate profiles, intensive legal work, and innovative policy campaigns can be hard for local organizations to sustain (though there are obviously exceptions). National networks can provide an important role of convening a set of local groups that are working on a similar issue and helping them create a fundraising strategy, as well as provide some share resources like communications, that make executing that strategy easier. What I found, as you can see in the map above (as well as the chart below the directory itself) is that the broader economic justice movement has been just as challenged to fund sustained organizing in the South and parts of the Midwest as the traditional labor movement has. And I think that’s a problem, because what it demonstrates to me is that, as the country’s population has shifted into the Sunbelt, we haven’t created organizing opportunities that give workers there hope that progressive employment policy will someday come. I was somewhat shocked to see, for example, that the City of Oakland, CA has more of these economic justice organizations (8) than the entire state of Florida (7). Or that America’s smallest state, Rhode Island, has as many groups fighting for better work as does the entire state of Alabama (2). I’m not trying to take anything away from folks who are doing this organizing in Oakland or Providence–in fact, I’m sure they could use more resources and support too. But we’ve got to do better about adding resources to groups that are working in severely underfunded places, if we want to ever be able to win federal legislation that creates an even playing field for all workers in the arena of wages, or paid time off, or racial justice at work, or any of the many things we fight for daily. And it clearly isn’t the fault of those organizers running national networks, who are rarely able to seed wholly-new organizing efforts in places that don’t already host it. The start up costs of creating a new organization in a new place will run hundreds of thousands of dollars per year–and the work isn’t going to pay off in victories in the first year. It isn’t easy to raise money to fund solid, consistent organizing work for the five years or more it can take to build a base of support and begin racking up organizing or legislative wins–and that can take even more time in places with unfriendly legislatures with few elected allies to champion work. Some of the national networks are connecting groups that do base-building or direct worker organizing (CPD, JwJ, NDWA, NDLON, ROC, etc. ), while others are connecting groups that provide legal support or help advocate for policy changes (PICO, Gamaliel, IWJ, etc.). In the places where our movement has had the most success winning local and statewide victories, you can see a rich ecosystem of groups that help support each others’ campaigns. We should be figuring out how to expand the map with those rich ecosystems, not contract in the few places we’re already winning to send resources elsewhere. I’ll be writing another post next week with some of my thoughts about what we can do to change this map–but I’m curious about yours, too. If you have thoughts that you want to share on this issue, leave them in the comments or shoot me an email at kati (at) hacktheunion (dot) org. I’ll include them in next week’s post, too. And of course–I know there are a ton of amazing worker centers out there that aren’t necessarily connected to national networks, but are still doing needed and important work–so if you know of them, please add them to the directory (I’ll be working to do the same, myself). *some notes on the map: I’m hoping to soon have a better one that you can dynamically click on, showing which actual organizations are represented here. The lack of clickability creates some representational problems on the map–for example, all of the organizations in GA (3) look right now like they’re in AL, and two TX groups look like they’re in Mexico. I did not display any of the 18 organizations listed as “national” in the database, which would have skewed the DC/NY numbers even more. In states where an organization has more than one office, I only used one of the cities to represent that entire organization. This is also only the map of the mainland US–there are three groups in the directory that are located in HI & PR, which I couldn’t fit in this screenshot.